Spark 1:43 resin replica of the #68 Ford GT as driven by Joey Hand, Dirk Muller and Sebastien Bourdais in the 2018 Le Mans 24 Hours. 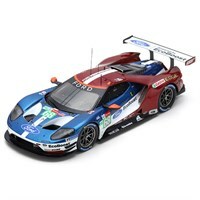 Spark 1:43 resin replica of the #69 Ford GT as driven by Ryan Briscoe, Richard Westbrook and Scott Dixon in the 2018 Le Mans 24 Hours. Spark 1:43 resin replica of the #66 Ford GT as driven by Stefan Mucke, Olivier Pla and Billy Johnson in the 2018 Le Mans 24 Hours. Spark 1:43 resin replica of the #67 Ford GT as driven by Andy Priaulx, Harry Tincknell and Tony Kanaan in the 2018 Le Mans 24 Hours.